Even in systems with an analog interface, most games did not take advantage of it. To these games, pushing the stick past a certain point, relative to the center, would register a movement in that direction. After the threshold, it did not matter how far you moved the stick, your player would not move any faster. Eventually, a PC peripheral making company called Advanced Gravis Computer Technology released a Nintendo-style gamepad, the Gravis PC Gamepad, that was the ideal controller for games with this "digital" style of handling joystick input. The Tandy 1000 adopted the CoCo joysticks to allow for a level of peripheral compatibility across otherwise incompatible computer lines. One joystick or mouse can be used with both kinds of computers. However, the Tandy CoCo and 1000s use a DIN-6 connector for its joysticks (mini-DIN 6 with 1000 RLX-B), the IBM PC use a DA-15 connector. 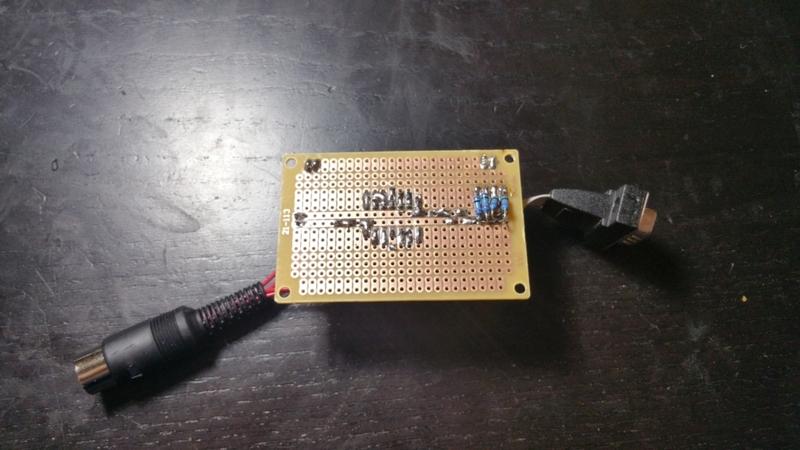 Even with an adapter, an PC stick won't work inside a CoCo or 1000 and vice versa. Unfortunately, Gravis released its PC Gamepad in 1991, when the Tandy 1000 was being discontinued. They would have had to release a Tandy 1000 version in order for it to work with a Tandy 1000, but it did not happen for obvious reasons. Although there has been little expressed interest in using an adapter in a Tandy 1000 as opposed to a Tandy CoCo or Dragon, I saw no reason why it would not work. This is my proof that it does. 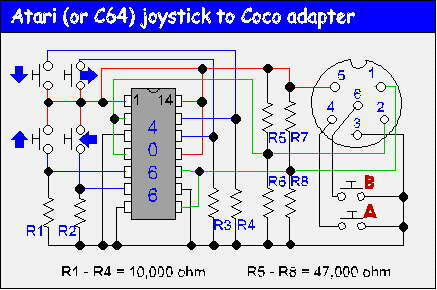 The interest in a digital joystick interface for the Tandy CoCo was not new. Wico made an adapter, the Wico Command Control Joystick Adaptor for use with Radio Shack TRS80 Color Computers, which allowed you to use an Atari 2600 or compatible joystick with your CoCo. 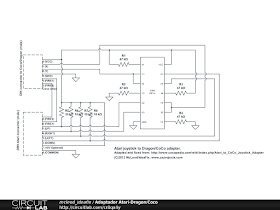 The adapter only supports one fire button, because the CoCo 1 and 2 only supported one button, as do the Dragon computers. The CoCo 3 supports a second button (the black button on the Tandy Deluxe Joystick), as does the Tandy 1000s. 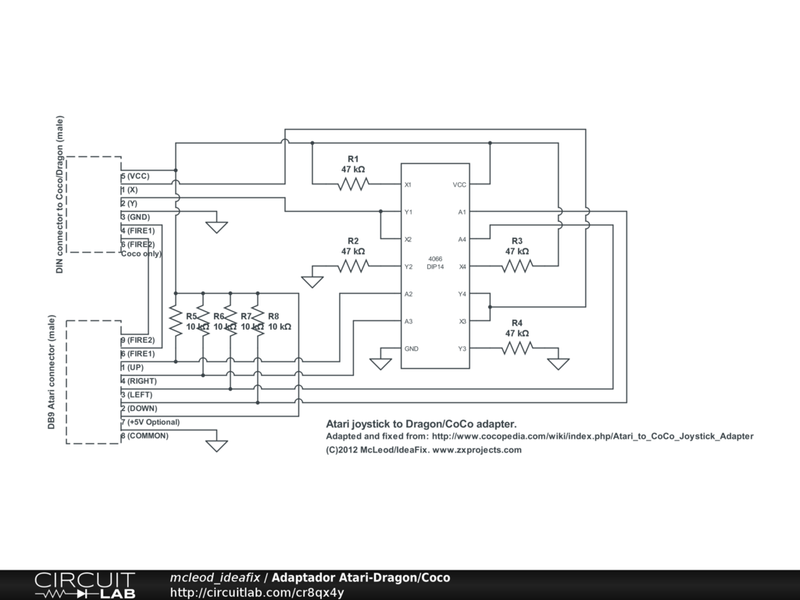 There was also an old article which described how a user could make an adapter, which you can read here : http://sparksandflames.com/files/atari%20joystick.pdf However, the schematic given in figure 2 has an error, so I would advise against using it without referencing the schematic below. 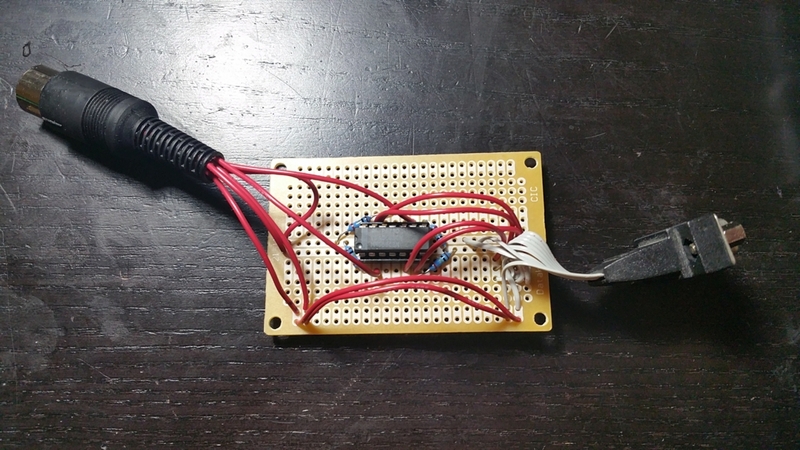 Both products are rather pricey given the simplicity of the circuit and cheapness of the parts. Unfortunately, I did not know about them before I decided to build my own adapter, by the time I finished I probably spent close to the amount they were selling theirs for. I ordered all the parts from Jameco. Unfortunately, my first board simply would not give all four directionals properly. I had hacked it up, used a dremel to try to eliminate bridges, but I could not get it to work. At best only one set of directionals would work. I threw the mess of a board away, but eventually I found the will to try again with a new board. One really helpful thing I did the second time around was to have the chip straddle the two rows of holes going down the long side of the board. I designated one row as +5v and the other row as GND and this made it easy to make all the connections I needed. I also used 1/4 watt resistors instead of the larger 1/2 watt resistors, this made it easier to mount the resistors on the small space I had on the board. Solder, patch wire and soldering iron. Female pin assignments are mirror images of male pin assignments, but since you are soldering wires from the male connectors to the prototyping board, the male assignments make it easier to figure out which wires go where. The first one is what I ended up using because it only requires one kind of resistor. It is the same schematic as the one given in the old article linked above, but includes a necessary fix. For either schematic, connect pin 9 on the Atari connector to pin 6 on the Tandy connector for the second fire button. 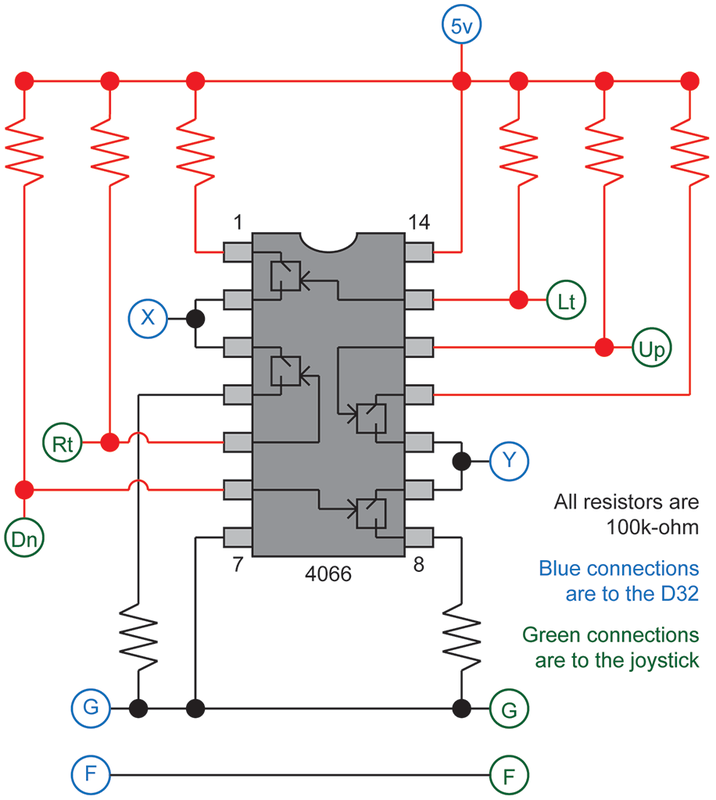 The second working schematic is a fixed and improved version of this schematic. 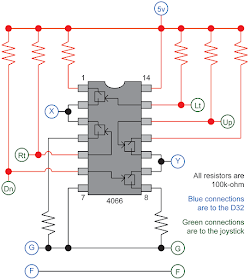 Ironically, only this schematic shows how to connect the second joystick button. If I had to do it over again, I would definitely use premade cables instead of soldering them to the hand-soldered DIN-6 plug and the ribbon motherboard DE-9 cable. I find the fit of the DE-9 cable a bit loose. For the Tandy 1000s, the later machines can disable the built-in Tandy joystick adapter and allow you to use a standard gameport on an I/O expansion or Sound Card. The TLs and SLs have 4-5 expansion slots, so they usually have room for a standard gameport. However, the RL and RLX only have one expansion slot, so this adapter may become useful. The pre TL and SL machines had no software way to disable the joystick ports, so this adapter is essential if you want to play arcade-like games with the best control possible.